Russian military surveillance satellite. Cancelled 1983. The Yantar-4KS2 was a heavy military optical reconnaissance satellite, required to have the same capabilities as the KH-11/Crystal reconnaissance satellite of the United States. Status: Cancelled 1983. Gross mass: 13,000 kg (28,000 lb). Cancelled when it proved impossible to provide such capability within the payload capacity of the Zenit-2 booster. The Yantar-2K was not capable of providing strategic warning of attack. Therefore three additional variants were developed, one of them the detailed electro-optical and operational reconnaissance satellite Yantar-4KS. The draft project on completed on 1 July 1977 based on a May 1977 draft project designated Yantar-6KS. A resolution of the chief designers dated 1 July 1977 began work on the project; this was confirmed by decree # 7-3 of the Soviet Ministers and Communist Party Central Committee dated 4 January 1978. 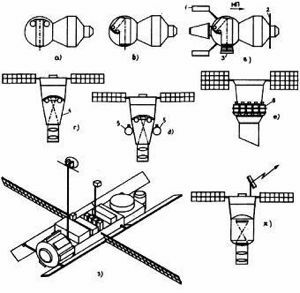 The spacecraft was designed to relay visual and infrared band images via a digital data link to the planned Potok-Luch GKRSS satellite system. There were two phases to the project plan. The first phase spacecraft, the Yantar-4KS1, would be launched by the Soyuz-U2 launch vehicle. Phase 2 would be the more capable Yantar-4KS2, launched by the more powerful Zenit launch vehicle, with flight trials to begin in 1983. The Yantar-4KS2 was required by the Ministry of Defense to have the same capabilities as the KH-11/Crystal reconnaissance satellite of the United States. Development was slow because of the state of Soviet digital electronics technology. It was finally concluded that the capabilities of the KH-11 could not be duplicated in the basic Yantar satellite bus. Accordingly a resolution of 1 June 1983 terminated work on the Yantar-4KS2 and directed that an modernized Yantar-4KS1 be developed instead. The KH-11 requirement was taken up as the new Arkon-1 satellite. Family: Military surveillance sat, Surveillance, Surveillance orbit. Country: Russia. Agency: Kozlov bureau. Bibliography: 451.